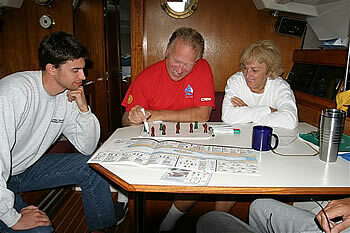 The Coastal Navigation course teaches you skills that ensure safe and successful navigation in coastal waters. A must for sailing along our coastal waters. The workbook manual: The book contains exercises at the end of each chapter/module which are done as a home based study. Chart work also forms part of the study. In addition to the workbook and chart, Bretton/Portland Plotter, and Chart 1 is supplied. Once the course work is completed, a morning of review / instruction in our on- site classroom or on the water completes the certification. On successful completion of the Coastal Navigation course you will have the confidence to safely navigate through challenging conditions, shallow waters, changing tides, and currents. None, but it is a prerequisite to the Advanced Cruising certification, for bareboat chartering and for attaining the International Certificate of Competency (ICC) for sailing and bareboating in Europe and the Mediterranean.